LAWRENCE, Kan. – Kansas football head coach Les Miles tabbed the leader of his defense as he announced the hiring of D.J. Eliot to be his defensive coordinator. Eliot arrives at KU with 20 years of coaching experience in the collegiate ranks, including the last six as a defensive coordinator. Eliot’s pedigree includes coaching stops at Florida State, Miami, Colorado and Kentucky, as well as time with proven winners and program builders Jimbo Fisher and Mark Stoops. Additionally, Eliot is among a select group of defensive thought-leaders that regularly clinic around the principles of the 3-4 defense, including Miles’ former defensive coordinator Dave Aranda. 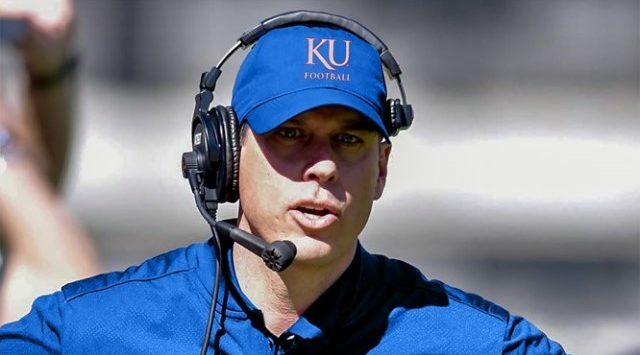 Prior to joining the Jayhawks, Eliot spent the 2017-18 seasons as the defensive coordinator at Colorado. His 2018 Buffaloes defense ranked fifth in the Pac-12 in total defense, but was especially good on third downs, ranking third in the league. During his stint at CU, cornerback Isaiah Oliver was selected in the second round (58th overall) of the 2018 NFL Draft by the Atlanta Falcons. Eliot joined the Colorado staff from Kentucky, where he was the Wildcats’ defensive coordinator and linebackers coach for four seasons (2013-16). He helped coach UK to the 2016 TaxSlayer Bowl, the first postseason appearance for Kentucky since 2010. At his previous two coaching stops, Kentucky and Florida State, he coached eight players who were drafted in the NFL, including two first round picks. Linebacker Bud Dupree was a 2015 first round selection of the Pittsburgh Steelers, the first Kentucky first-rounder in 12 years, and defensive end Bjoern Werner from Florida State, who was selected by Indianapolis in 2013. Overall at Kentucky, he coached 11 Wildcats who earned All-SEC recognition and in three of his four years with the school one of his linebackers recorded over 100 tackles in a season. Avery Williams recorded 102 stops in 2013, Josh Forrest posted 110 in 2014, a figure that ranked No. 3 in the SEC that season, while Jordan Jones had 109 in Eliot’s final year with UK. At Kentucky, the Wildcats set a new school record for defensive touchdowns scored in a season with six in 2014; UK recorded 23 takeaways that year. UK jumped 45 places in total defense rankings from 2013 to 2014 under Eliot, finishing in the top half of the nation in that statistic. In 2015, UK ranked 28th in the FBS in passing defense by giving up only 198.1 yards per game, And in 2016, sophomore safety Mike Edwards finished the regular season leading all SEC defensive backs in tackles (93) while tying for the team lead in interceptions with three, two coming against No. 11 Louisville and Heisman Trophy winner Lamar Jackson in the Cats’ 41-38 victory. His presence at Florida State helped lead a revival of FSU’s defense. The year prior to his arrival, the Seminoles ranked 108th in total defense and rushing defense. However, by 2012, FSU ranked second nationally in total defense (254.1 yards per game) and sixth in scoring defense (14.7 points per game). In his three seasons at Florida State (2010-12), the ‘Noles went 31-10 and he helped FSU tie for the national lead in sacks with 48 his first year there. In his second season FSU limited opponents to just 2.35 yards per carry, which led the nation in that category. His defensive ends on the 2012 team, Werner and Cornellius Carradine, combined for and 31 tackles for losses, including 24 sacks, when FSU finished 12-2. Werner went on to be named the ACC Defensive Player of the Year on his way to earning All-America honors. In his second of three seasons at Rice (2007-09), he helped the Owls go 10-3 and win the 2008 Texas Bowl, the program’s first bowl win since 1950 and first 10-win season since 1949. Eliot got his start in coaching at his alma mater, Wyoming, as a graduate assistant in 1999. From there he went to Houston as a graduate assistant for two years before landing in a similar position at Miami for the 2002 season; the Hurricanes went 12-0 and were ranked No. 1 at the end of the regular season before falling 31-24 in double overtime to Ohio State in the BCS National Championship Game. He spent two years in Division I-AA (FCS), coaching the linebackers at Texas State (San Marcos). He helped lead a defensive turnaround (34.8 to 20.3 points per game, as well as 395 to 314 yards allowed). In 2005, the Bobcats went 11-3, reaching the semifinals of the I-AA playoffs. Eliot lettered at linebacker at Wyoming for coach Dana Dimel and graduated with a bachelor’s degree in natural science in 1999. He earned his master’s degree in education from Houston in 2002. He grew up in Edmond, Oklahoma, graduating from Edmond Memorial High School, where he lettered in football and basketball. He and his wife, the former Miekel Marsh, have one son, Dawson, and three daughters, Drue, Page, and Reace.